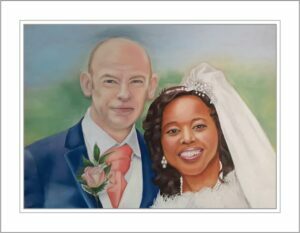 I commissioned Susan to paint a wedding portrait in soft pastel from a photo as a gift for my friend’s wedding. The photo I decided upon was one that represented them in the most natural way possible, the one that represented best both their personalities. The finished portrait felt like time had stopped, it’ll be a moment that the couple will treasure now that they have it on the wall in their new home – they were delighted with the gift and it is hung pride of place in their new home together. Susan went to a lot of trouble to capture the details of their faces – the pride of the groom and the joyful nature of the bride. The result replicates very well the photo and Susan knew how to make the background beautiful whilst keeping it secondary. I was kept me up to date throughout the process, Susan asked questions about specific details and sought my opinion when she had several interpretations possible. I would recommend Susan as a portrait artist; she takes her time to get everything right. She knows what she needs in terms of a good photo and then takes care with each stage, especially with hair and facial features to make sure the personalities of the people are well captured. The newly weds are really happy with their portrait and it’s going to take pride of place in their new home together.